This exhibition will bring together the work of Augustus Thompson (b.1985) and Bryan Morello (b.1988) for the first time. Examining new methods of self-portraiture, the works included constitute traces or secretions from projects past that, exhibited anew, conjure new narratives and meaning through mode of display and juxtaposition. In LA-based Thompson’s latest installation, the artist takes on the role of organizer and collagist of cultural information in order to initiate a dialogue about the self. Building an archival self-portrait by appropriating images from various sources including social media feeds, music videos and texts, the artist layers printed works upon one another to form a floor-based collage. For Digital Physical, Thompson returns selected prints to the wall of the gallery, where they can be understood autonomously and in conversation with Morello’s own self-study. Compositions where Chicago rapper Chief Keef’s Instagram ‘selfies’ meet aerial shots of the Grand Canyon taken from airplane windows, are superimposed on images of the artist’s studio, construction sites and consumer objects the artist finds desirable to create semi-abstract compositions. The result is a personal image stream that seems to represent an attempt to come to terms with the speed at which image streams themselves undulate and flow, and affect our contemporaneous visual landscape. San Francisco native Morello will create a new wall-based sculpture for Cold Boy’s Fire, based on a monologue the artist wrote for and performed at alternative mobile exhibition space ALTAR last month. 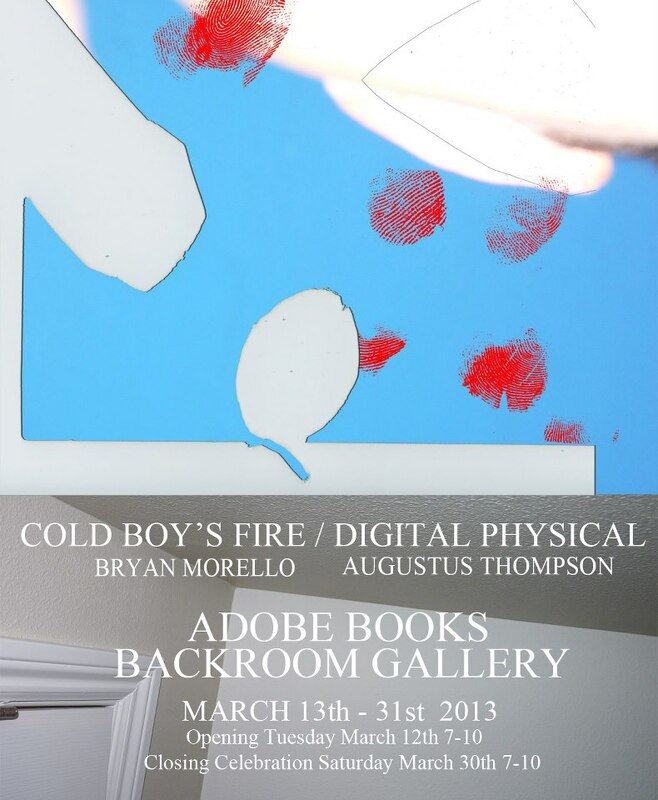 The installation at Adobe Books Back Room Gallery will comprise sections of text from the script of the performance integrated into a stage-like sculpture. Investigating different temporalities of absorbing poetry, words written for recital return to their textual genesis and invite a new kind of contemplation from the viewer. This exhibition is guest curated by Antonia Marsh, a writer and independent curator from London, currently completing a Masters in Curatorial Practice in California College of the Arts, San Francisco. The 2013 Adobe Books Blitz is underway!